Binga District is one of the least developed districts in Zimbabwe, with women and children most acutely affected by poverty. Women have been excluded in the development realm for many decades and this has resulted in unequal access to, and utilization of, natural resources of economic importance. Therefore, targeted support to boost participation in diverse, economically viable and natural resource-based enterprises can increase rural women's incomes and help them escape the poverty cycle. The Bbindawuko Women Fishing Project has made history in Zimbabwe by empowering rural women to venture into the traditionally male- dominated fishing industry. This is the first project of its kind to engage the Tonga women since the displacement of this ethnic group in the late 1950's by the colonial Government. 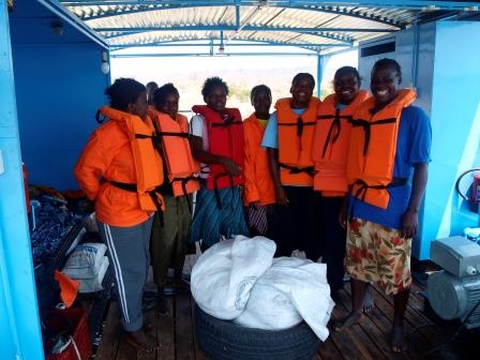 Women’s participation and contribution in the fishing industry has since then not been prioritized by the relevant authorities despite the fact that granting women access to this resource has the potential of significantly reducing poverty and food insecurity in the District. Ten rural women (referred to as "Queens of the Lake") currently own and operate a kapenta fishing rig. Traditionally, Tonga women had significant power within the community regarding access to and utilisation of natural resources. They used to fish using ‘baskets’ called ‘Zubo’. With the support of the UN Women and the Rosemary Cumanzala's Zubo Trust in partnership with Basilwizi, a user friendly kapenta rig was sourced for the group. The rig has special features such as a hydraulic winch, fish finder, built-in toilet and shower, which enables the women to operate it with ease. By venturing into this previously male dominated industry, women have succeeded in debunking the myth that ‘kapenta fishing’ is for men only. The women members are now managers, breadwinners and employers of men. Zubo Trust's experience with the project is that with improved economic status, women’s confidence and self-esteem increases. They tend to become more involved in community decision making that can in turn lead to changes in social practices and power relationships and mobilize social action leading to effective political participation.